Floor plans are an artist conception and square footage is approximate and may vary by unit type or location. Pricing can change based on availability and move-in date. Call the leasing office for further details. *Rental pricing is based on availability and can change at any time without notice. Square footage is approximate and can vary based on floor plan layout and location. Please call the leasing office for details. 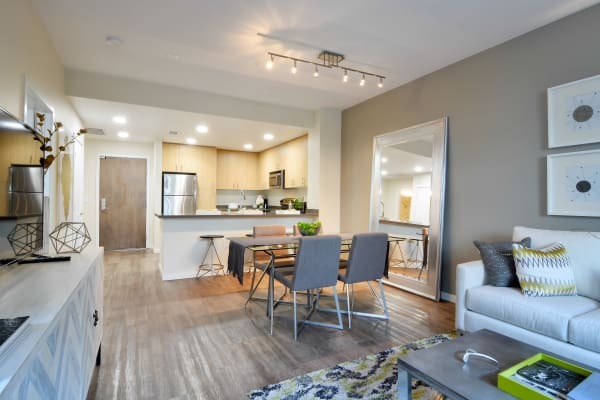 Whether you’re a party of one, a pair of roommates, or anyone else looking for a one or two bedroom apartment for rent in Mountain View, California, Domus on the Boulevard is your ideal destination for modern living. We offer several unique layouts for our one bedroom, one bath and two bedroom, two bath apartments. And with exceptional extras like a private balcony or patio, walk-in closet, and convenient in-home washer and dryer, you can make the most of your space at Domus. Ready for a first-hand look at Domus on the Boulevard? Contact our leasing office today to schedule your personal tour of our pet-friendly apartments near San Francisco.